The Baryon Oscillation Spectroscopic Survey (BOSS) is an astronomical survey designed to measure the rate of expansion of the Universe. It will focus on the spatial distribution of Luminous Red Galaxies (LRGs) and quasars. BOSS is one of the four components of the Sloan Digital Sky Survey (SDSS-III). SDSS-III is used to cover distant quasars at far reaches of the universe, the distribution of galaxies, the properties of stars in the Milky Way and also subjects such as dark matter and dark energy in the universe. On March 2012, BOSS announced the most accurate measurement yet of the distance scale of the universe during the era when dark energy turned on. "This is just the first of three data releases from BOSS," says David Schlegel of the U.S. Department of Energy's Lawrence Berkeley National Laboratory (Berkeley Lab), an astrophysicist in the Lab's Physics Division and BOSS's principal investigator. "By the time BOSS is complete, we will have surveyed more of the sky, out to a distance twice as deep, for a volume more than five times greater than SDSS has surveyed before – a larger volume of the universe than all previous spectroscopic surveys combined." Spectroscopy yields a wealth of information about astronomical objects including their motion (called redshift and written "z"), their composition, and sometimes also the density of the gas and other material that lies between them and observers on Earth. The BOSS spectra are now freely available at http://sdss3.org to a public that includes amateur astronomers, astronomy professionals who are not members of the SDSS-III collaboration, and high-school science teachers and their students. The new release lists spectra for galaxies with redshifts up to z = 0.8 (roughly 7 billion light years away) and quasars with redshifts between z = 2.1 and 3.5 (from 10 to 11.5 billion light years away). When BOSS is complete it will have measured 1.5 million galaxies and at least 150,000 quasars, as well as many thousands of stars and other "ancillary" objects for scientific projects other than BOSS's main goal. BOSS is designed to measure baryon acoustic oscillation (BAO), the large-scale clustering of matter in the universe. BAO began as rippling fluctuations ("sound waves") in the hot, dense soup of matter and radiation that made up the early universe. As the universe expanded it cooled. Finally atoms formed and radiation went its own way; the density ripples left their marks as temperature variations in the cosmic microwave background (CMB), where they can be detected today. The CMB came into being 380,000 years after the big bang, over 13.6 billion years ago, and continues to stretch across the entire sky as the universe expands. Peaks in CMB temperature variation occur about half a billion light years apart, at the same angle, viewed from Earth, as peaks in the large-scale galactic structure that evolved billions of years later. The regions of higher density in the CMB were in fact the sources of galaxy formation; they correspond to regions where galaxies cluster, along with intergalactic gas and concentrations of much more massive underlying dark matter. The natural "standard ruler" marking peaks in clustering can be applied not only across the sky but in all three dimensions, backward in time to the CMB. Distant quasars provide another way of measuring BAO and the distribution of matter in the universe. Quasars are the brightest objects in the distant universe, whose spectra bristle with individually shifted absorption lines, a "Lyman-alpha forest" unique to each that reveals the clumping of intergalactic gas and underlying dark matter between the quasar and Earth. Schlegel has called BAO "an inconveniently sized ruler," requiring "a huge volume of the universe just to fit the ruler inside," but it's a precision tool for tracking the universe's expansion history, and for probing the nature of gravity and the mysterious dark energy that's causing expansion to accelerate. 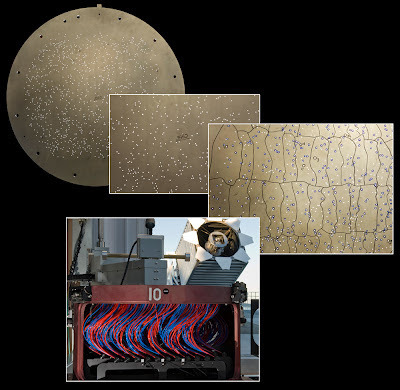 SDSS uses "plug plates" at the telescope's focal plane, aluminum disks with holes drilled to match the precise position of previously imaged target objects. SDSS-I and II plug plates had only 640 holes apiece, each covering three arcseconds; BOSS is using 2,000 plug plates with 1,000 holes apiece, each covering a tight two arcseconds to reduce light that's not from the target. "Light from distant galaxies arrives at Earth redshifted into the infrared," says Natalie Roe, director of Berkeley Lab's Physics Division and BOSS's instrument scientist, who led construction of the spectrographs. "We optimized the BOSS spectrographs for mapping exactly these galaxies." Working with Schlegel and Adam Bolton at the University of Utah, Berkeley Lab's Stephen Bailey is in charge of daily "extraction pipeline" operations that convert raw data from the telescope into useful spectra and quantities derived from them, ready for scientific analysis. Data storage and the extraction pipeline run on the Riemann Linux cluster of Berkeley Lab's High-Performance Computing Services Group; the data is copied from Riemann to the University of Utah, New York University, Johns Hopkins University, and the National Energy Research Scientific Computing Center (NERSC) at Berkeley Lab. The Lab also hosts the SDSS-III website, http://sdss3.org, from which the data can be downloaded. "Data releases are a proud tradition for SDSS, and the first BOSS data greatly increase the SDSS store of information," Bailey says. "Members of the SDSS-III collaboration get first crack at it – with barely enough time to write up their results – but three times as many papers based on the data are published by scientists outside the collaboration." 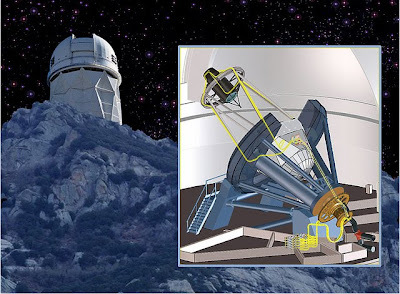 Says Schlegel, "SDSS-III is already the most used of all surveys from any telescope in the world, including the Keck telescopes and the Hubble Space Telescope. With DR9, BOSS contributes a huge information increase for all kinds of scientific investigations, from quasars to how stars evolve to really odd objects like galaxy-scale strong gravitational lenses. Meanwhile the BOSS BAO survey is over two-thirds finished, and ahead of schedule – we're well on our way to the best measure of BAO that will be made for a long time. All the data BOSS collects will be available to anyone who can use it."